Husqvarna are known for producing fantastic equipment and machinery that is very capable of working in frighteningly cold weather. Husqvarna originated in Sweden after all, and that place gets very cold in the winter months! The Husqvarna 1830HV Snow Blower is another example of their commitment to producing quality machines. 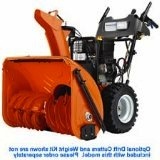 This dual stage snow thrower has a clearing width of 0.76 m (30 inches) and an intake height of 0.58 m (23 inch) which will be more than enough for the average home owner, so you will mostly find this machine being used by professionals. The Husqvarna 1830HV snowblower is powered by a large LCT 4 stroke gasoline engine. This engine has a displacement of 0.41 liters and has a fuel tank that is capable of holding up to 1.9 liters (0.5 US gallons) of gasoline. The engine provides the 1830HV dual stage snowblower with 18 ft-lbs of torque and which drives the wheels, auger and impeller. The engine is started by either the old fashioned way (which is a pull cord, recoil mechanism) or it’s started with a push button electric starter that is powered by mains electricity. The Husqvarna 1830HV dual stage snow thrower transmits power to the wheels via a chain drive system housed in an aluminum gear case. The wheels are specifically designed for the snow and are X Trac tires. The auger on the Husqvarna 1830HV dual stage snow blower has a diameter of 0.3 m (12 inches) and is forged from serrated steel so that it easily cuts up compacted snow and ice. Thanks to the power provided by the engine, the auger will also happily take care of small branches and debris without stalling or deflecting and bending (although you should try to avoid anything that isn’t snow when using this machine). The impeller then forces the snow out through the chute. If you are looking for smaller Husqvarna snowblowers, then check out the Husqvarna 12527HV Snow Blower or the Husqvarna 11527SB Snow Blower. Click Here to buy the Husqvarna 1830HV Snow Blower. When my ’84 Chevy plowtruck finally gave out I bought this Husqvarna to clear my 790 foot driveway in Maine. It’s a big job and this machine handled it very well. -Powerful auger cuts through hard packed snow, even the berms left at the end of the driveway by snowplows. -Self propulsion works well, though the speeds can take a little getting used to. -Maneuverability is excellent, this machine can turn around in it’s own footprint. *** I wrote a much more in-depth review about this snowblower at a review website I write for (epinions.) Copywrite reasons prevent me from posting the whole review here, but a link is below. I think you will find it helpful and informative. I do answer questions left in the comment section on that review, so ask away!